For almost 50 years, astronomers have puzzled over the youthful appearance of stars known as blue stragglers. Blue stragglers are the timeworn Hollywood starlets of the cosmos: They shine brightly, they are older than they appear, and they have, disconcertingly, gained mass at a late stage of life. "These blue, luminous stars should have used up their hydrogen fuel and flamed out long ago," explains Robert Mathieu, a University of Wisconsin-Madison astronomer. "Yet they are still here. By some means or another, they have recently increased their mass, their fuel supply." Now, Mathieu and Wisconsin colleague Aaron Geller, writing Dec. 24 in the journal Nature, show that blue stragglers, in most if not all cases, steal that mass from companion stars and that they sometimes do so by crashing into their neighbors, a scenario once thought far-fetched by astronomers. In the new Nature report, Geller and Mathieu show that the mass-gathering ways of blue stragglers conform to all three of the scenarios astrophysicists have dreamed up for them to get bigger and continue to shine brightly when stars of a similar age and mass have evolved to stellar corpses. The possibility of stellar smashups, says Mathieu, is greatly enhanced in the star cluster mosh pit as binary star systems brush up against one another and swirl into intersecting and, sometimes, collision-course orbits. The new insight into the delayed evolution of blue stragglers, stars first observed and named in the 1950s, rests on a decade of careful observation of an old star cluster known as NGC 188. Situated in the sky near Polaris, the North Star, and located some 6,000 light years from Earth, NGC 188 is a gathering of perhaps several thousand stars, all about the same age, and has 21 blue stragglers. Recently, astrophysicists hypothesized that blue stragglers got bigger in three possible ways, all of them involving companion stars that orbit one another. The first suggested possibility, Mathieu explains, involves two stars in a relatively close binary orbit with one of the stars puffing up into a red giant, a type of star that has run out of fuel and that then grows to be much larger than an ordinary star. In this scenario, the red giant dumps its outer envelope onto its companion star, setting the stage for it to become a blue straggler. More recently, astronomers are seeing ways for stars to collide, once thought to be impossible. The odds of ordinary stars colliding are almost nil, but when binary star systems cross paths, gravitational chaos ensues and there is a much greater chance of stellar smashups, Mathieu notes. The third way a blue straggler might be created is when a third star brushes up against a binary star system, exerting enough pull for the binary stars to merge with each other into one more massive star. "In all three scenarios, you end up with more massive stars called blue stragglers," notes Mathieu. "In short, these are stars that seem to go bump in the night." An expert on binary stars, Mathieu has been observing the NGC 188 star cluster for a decade. Much of the observing was done using the 3.5-meter WIYN Telescope on Kitt Peak, Ariz., an observatory operated by UW-Madison, Indiana University, Yale and the National Optical Astronomical Observatory. 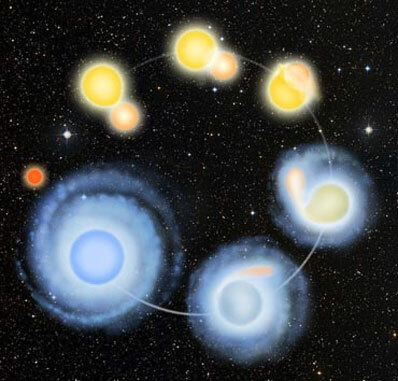 Mathieu and his colleagues noted that at least three-quarters of the blue stragglers in the NGC 188 cluster occur in binary systems: "These aren't just normal stars that are straggling behind in their evolution. There is something unusual going on with their companions." Geller, a UW-Madison graduate student, notes that NGC 188 has a relatively large number and diverse types of blue stragglers, including one binary system made up of two blue stragglers. This astonishing object, argues Geller, is emblematic of the complex binary dances and exchanges, including "partner swapping," occurring in the NGC 188 environment: "Almost certainly these blue stragglers formed separately, and then the two binaries that each were in encountered one another, ejecting two of the stars and leaving behind this truly unique object." The long, patient survey of NGC 188's blue stragglers also reveals that the stars are spinning much faster than your average star, a quality that Mathieu and Geller hope to use to determine how recently the blue stragglers were formed. "People have been trying to find distinguishing properties of these stars for 50 years," notes Mathieu. "What blue stragglers are showing us is that life in a star cluster is rarely a lonely existence."